As far as unnecessary sequels go, “Finding Dory” is actually pretty darn good. Nothing will ever match the sheer joy of the first film but this follow-up certainly makes its mark in the glorious Pixar cannon. It obviously loses some originality points for being somewhat familiar and can't match the obviously far-out antics of last year's masterpiece “Inside Out.” But why should it? In a time when sequels are so common it's a breath of fresh air just to have one that is simply great – even if it never really needed to be made in the first place. Luckily, this underwater world created by the geniuses at Pixar is brimming with enough new colorful characters and smart gags that make “Finding Nemo” one of the better “Pixar-lite” entries. “Finding Nemo” was essentially an underwater road trip movie. Clownfish Marlin (Albert Brooks) was searching the open Australian Ocean for his lost son Nemo and hesitantly teamed up with lovable blue tang Dory (Ellen DeGeneres) who suffers from short term memory loss. In case you were living under an underwater rock all those years ago, Nemo was found and they all lived happily ever after. 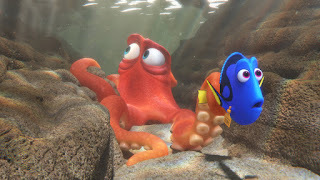 Now, taking place a year after the events of the first movie, Dory has a revelation and realizes that she has a family and may knew where to find them. This takes her, Marlin, and Nemo on a crazy adventure across the ocean in and around the Marine Life Institute which involves the voice of Sigourney Weaver in what is one of the movie's best running gags. There are plenty of new colorful characters involved here. There's a pair of captive whales voiced by It's Always Sunny's Kaitlin Olson and Modern Family's Ty Burrell. The one who really steals the show this time is a disgruntled octopus who's named Hank voiced by Ed O'Neill. There are some truly inspired bits here as Dory, Marlin, and Nemo find themselves hoping from body to water to body of water throughout the institute trying to figure out where Dory's parents are. There's one bit involving an unfortunate stop in a kids' touch tank that is hilariously rendered by those clever Pixar people (including co-directors Andrew Stanton and Angus MacLane). Trailer for Finding Dory on TrailerAddict.